The proud spires of The Silver Tree shimmered in the high afternoon sun, and Ochuru walked beneath its shade gratefully. It was good to be aglow with the knowledge of the universe. The Tree appeared out of nowhere, its towering figure announcing itself with bursts of sunfire and ground-shaking thunderclaps just nine sunsets previous. Ochuru was the only one of his tribe courageous--or foolish--enough to venture towards it. He remembered when he first peered into its cavernous maw and noted the strange, incinerated figures hanging from the top of the tree's hollow, their blackened limbs twisted like the scorched branches of an acacia after a great fire. And he remembered drinking the sap that flowed from The Tree's odd corners. The glowing liquid warmed his insides. And more importantly, it made Ochuru dream, whether he slept or roamed attentively about the silver hollow. So Ochuru began following the dreams that swirled about his consciousness at all hours of the risings of sun and moon. He pulled shaped chunks of detritus from within the belly of The Tree, and used the shiny bark to whittle and etch at a nearby Nruga trunk. The visions manipulated his simian paws into carving a quadrupedal figure from the pink speckled wood. The dreams compelled him to carve the face of a human woman atop the Quadruped's neck, dyeing her lips with the juice of red berries. Then he broke off several branches, weaving and contorting them into the shape of a crown. When he finished, he dragged his Woman-Horse creation back to The Silver Tree. Ochuru hollowed out the figure's back with another shard of sharp silver bark and ran into the hollow with a gourd, collecting more Glow Sap from The Tree's hollows. The enlightened monkey anointed his carving with the sap, and the figure's eyes fluttered open. "I can carry you, my Prince," the Quadruped purred in a buttery voice as she turned her swan-like spotted neck, bowed and placed the Nruga branch crown atop Ochuru's head. The Monkey Prince stepped into his Quadruped's open back and seated himself, a cluster of Gargoyle Lillies in his left paw and a gourd full of the Silver Tree's nectar in his lap. His four-legged feminine transport followed his command to traverse the land's only man-made path out of the heart of the jungle. All along the way Ochuru submerged his Lily Sceptre into the sap-filled gourd and flicked the moistened Lily stalks at the ground below him. Each droplet connected with the ground and transformed: Green pitcher plants, serpents with heads of felines, and speckled spined multi-hued stalks and tubes erupted from the earth to eject perfume and rustling life into the humid wilderness air. Then all twenty-seven-thousand species of alien flora and fauna pulled themselves from the soil and followed Ochuru the Monkey Prince as he made his way towards the City of Man. Written by TwoPotatoThreePotato, illustration by 14: acrylic on paper, digital color. Call me a philistine, but I think this is a fabulous rendering of brangelina. 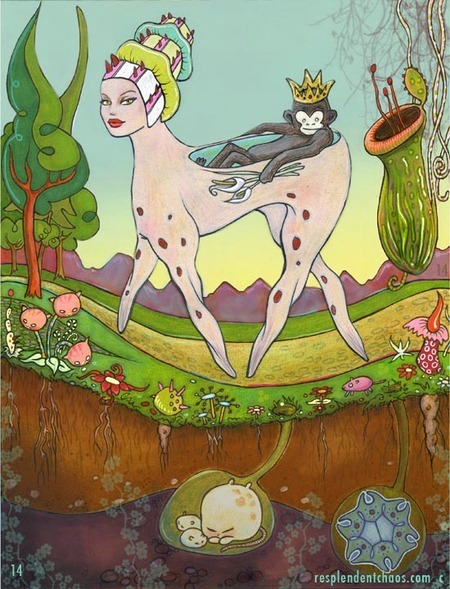 what a great story and painting...i love your work, i'm really excited about the botany in wonderland!